LIVERPOOL: Liverpool powered back to the top of the Premier League after Mohamed Salah’s stunning strike clinched a 2-0 win over Chelsea yesterday. 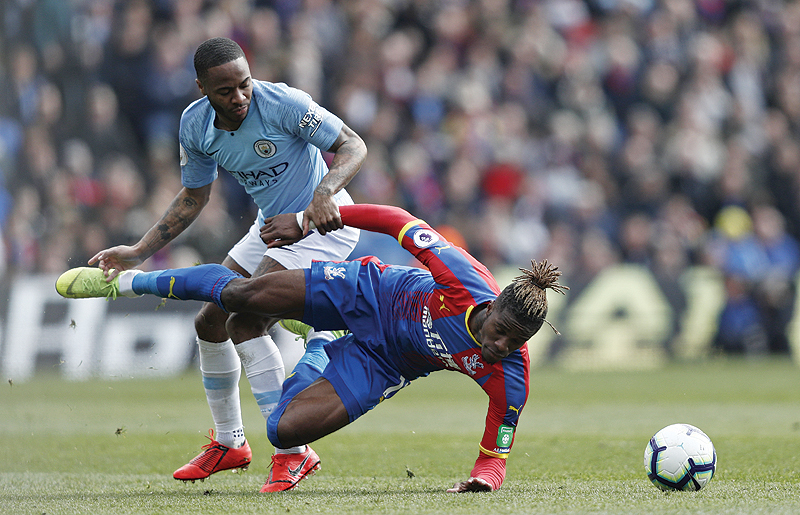 Jurgen Klopp’s side had surrendered pole position a few hours earlier when Manchester City won 3-1 at Crystal Palace, piling pressure on the Reds to respond as the title race heats up. Chelsea posed the last major threat to Liverpool’s title bid, yet the leaders dealt with the challenge impressively to mark Klopp’s 200th game as Reds manager in style. With City having difficult league fixtures looming against Tottenham and Manchester United, Klopp’s men are convinced they can hold onto pole position. Their run-in is undoubtedly less daunting than City’s, with Cardiff, Huddersfield and Newcastle on the schedule before a potential title party against Wolves at Anfield. For fourth-placed Chelsea, the loss was a blow to their bid for Champions League football next season and they will drop to fifth if Arsenal win at Watford today. On the eve of the 30th anniversary of the Hillsborough disaster that killed 96 Liverpool fans and in the week that club legend Tommy Smith passed away, there was even more emotion at Anfield than usual. After a minute’s silence featuring mosaics reading “30 years” and “96” held up by fans around the ground, Liverpool’s focus was trained on avenging one of the more painful defeats in the club’s recent history. But Klopp insisted his players wouldn’t be haunted by the ghosts of that collapse and they were true to his word. Liverpool threatened an early goal when Mane whipped a pin-point cross towards Salah and he fired a volley that Chelsea keeper Kepa Arrizabalaga held well. Instead, City broke to seal the three points on the counter-attack when the outstanding Kevin de Bruyne teed up Gabriel Jesus to make it 3-1. The trip to south London kicked off a massive week for City with Tottenham to visit the Etihad Stadium twice in the next six days for the second leg of their Champions League quarter-final and a vital Premier League clash with implications for both the title and top four race. After a similar sitter at Burnley last season, Guardiola quickly hooked Sterling in his frustration. However, Sterling showed his maturity and why he is a contender for player of the year awards by redeeming himself in emphatic fashion just four minutes later.